A few weeks ago I wrote a postabout Jessica Watson, the sixteen-year old Australian girl who is attempting to be the youngest person to sail solo around the world. 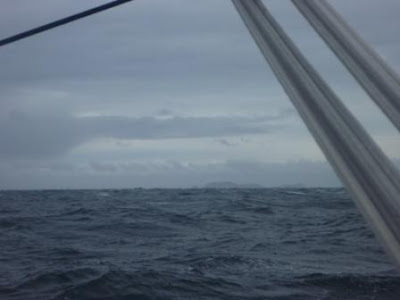 This morning she rounded Cape Horn. This is a major milestone. It's the first land she's seen in three months. The picture below was taken by Jessica. Later today her parents will be departing Chile and flying overhead. She's now making her way into the Atlantic and heading north for warmer temperatures. Check out Jessica's blog. You can track her progress at her www.jessicawatson.com.au.